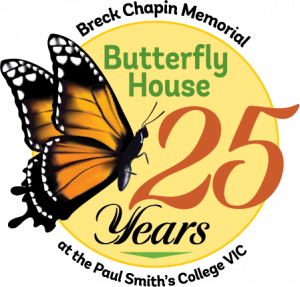 Celebrating 25 years of the Butterfly House! Adjacent to the VIC Building is the Breck Chapin Memorial Native Species Butterfly House, featuring butterflies and moths in all stages of development. It is open from 11 AM to 4 PM, seven days a week throughout the summer, weather permitting. The Butterfly House will be open weekends starting June 16th, and 7 days a week between June 23rd and September 3rd, 2018. Admission to the VIC Butterfly House is free. If you’d like to support the Butterfly House, please considering become a supporting member by joining our Friends Group or simply donate to the Butterfly House. Visitors can view native butterflies up close and learn about the life stages and migratory patterns of these colorful insects. Butterfly House volunteers are available to point out the species of butterflies in the house that day, provide information on the insect’s life cycle, and identify specific plants that are favored by each species. Inside the Butterfly House, there are nectar plants for food and host plants for egg-laying and caterpillar feeding. There are also touch boxes and information handouts on butterflies and moths. Outside the Butterfly House is the Frank Hutchins Butterfly Garden, a garden designed to attract butterflies and named to honor the late Frank Hutchins, a longtime supporter of the VIC. Butterflies live between 2 and 3 weeks, depending on species. The Spring Azure lives only two to four days, while the Mourning Cloak may live as long as ten to eleven months. The life span of Monarch Butterflies vary, from three weeks in the spring and summer to about ten months in the fall and winter. Large silkmoths live between 8 and 10 days. Butterflies have several strategies for coping with the harsh seasonal conditions that characterize the Adirondack region. Some butterflies hide in woodpiles, inside trees, or in houses. They enter a sleep-like condition called diapause that is probably triggered by decreasing day length. Some future butterflies overwinter as caterpillars hidden in a hibernaculum — a leaf that is chewed and rolled into a winter nest and hangs from a twig with silk spun by the caterpillar. Slowed metabolism or arrested development in the case of eggs, caterpillars, or chrysalids allows butterflies to conserve their energy during the cold winter months. Other butterflies migrate to escape the cold. 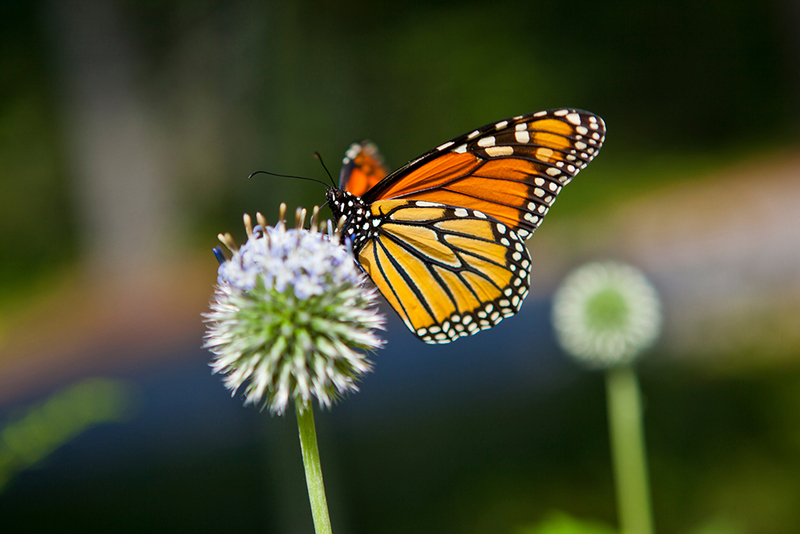 Eastern Monarchs migrate south to Mexico, journeying 2500 miles; another generation returns. 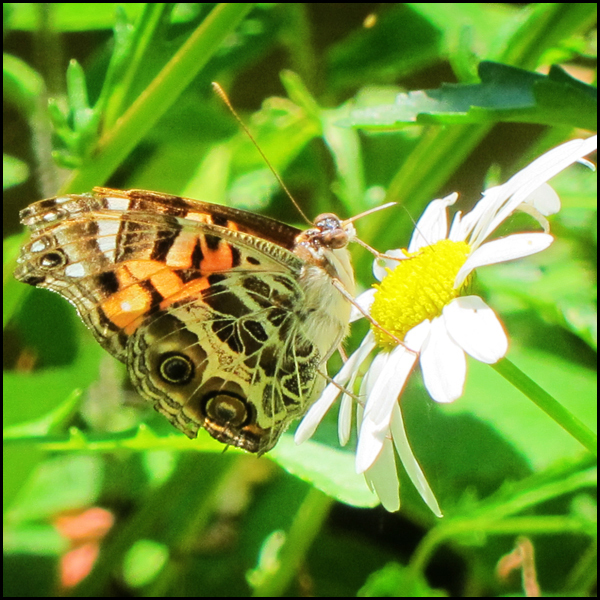 It is thought that the Painted Ladies migrate from warm southern areas or Mexico, while Red Admirals are thought to migrate from overwintering grounds in Florida and Texas. Most butterflies have the ability to live off fat reserves left over from the constant munching they did as caterpillars. However, they also feed from tree sap and nectar in their adult state. Although their searches for flowers appear to be random, sensory clues play an important role. Butterflies can see ultraviolet light, which helps them identify a preferred plant. They can also determine the health of the plant by scratching it. The butterfly’s main predators are spiders, birds, frogs, snakes, rodents, bats, dragonflies, assassin bugs, and ambush bugs. In addition to defenses such as coloration and tailed wings, butterflies also have scales on their wings which seem to come off like powder. Scientists theorize that this adaptation is used to escape from spiders; butterflies shed their scales to release themselves from spider webs. Why are butterflies distinctly colored and patterned? The bright colors of the butterfly serve as a vital aspect of the butterfly’s defense. For instance, the bright orange wings of the Monarch Butterfly tell predators: “Don’t eat me; I am toxic.” Birds that have eaten a monarch vomit within fifteen seconds and do not fully recover for up to half an hour. The swallow-like tails of some butterflies and the eye spots found on many butterfly wings also serve as a mechanism to ensure survival. These patterns and projections draw the predator’s attention away from the most vital part of the butterfly’s anatomy — its body. Some butterflies, such as member of the Satyr family, have dull colors. These butterflies inhabit partially shaded woods; and their brownish coloring provides a natural camouflage. There are three main differences separating moths from butterflies: antennae, body size,and wing position when resting. Moths tend to have more robust and hairy bodies, feathery antennae, and rest with their wings spread out. Butterflies usually have narrower bodies, antennae that are wiry and end in a club, and rest with their wings folded. Another useful clue is to note what time of the day the insect is active; in general, moths are active at night and butterflies during the day. What’s the difference between a male and a female? The primary difference between a female and a male is body size. Female butterflies are born with all their eggs and therefore have a more pronounced abdomen. Males have a narrower abdomen; and most have claspers that aid in gripping the female when mating. Where can I find butterflies in the wild? Butterflies can be found in a variety of habitats. Most prefer open fields with many flowers, but some butterflies can be found in cooler, moister areas, such as woods. Some butterflies prefer eating sap from trees (as opposed to nectar from flowers) and can be found on birch and willow trees. One family of butterflies — Satyridae — are frequently found in the woods. They have dull brown coloring, in order to blend in with their environment. How can I garden to attract butterflies? 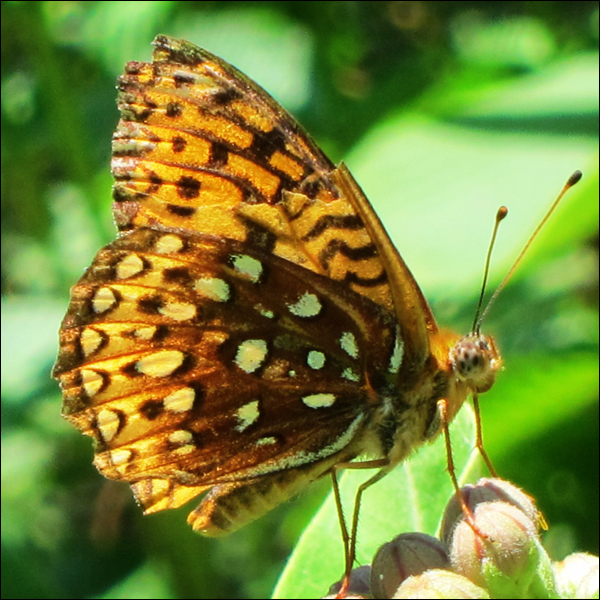 You can create an environment that butterflies find appealing by planting native flowers in clusters and planting caterpillar and nectar food plants that bloom throughout the summer season. Avoid the use of pesticides and provide attractions such as mud puddles to entice the insects to visit near your home. Where do the insects in the Butterfly House come from? The VIC nets the adults and brings them in. All the insects in the Paul Smiths Butterfly House are from the Adirondack Park, except those butterflies which migrate, such as Monarchs, Red Admirals, and Painted Ladies. Many of the butterflies in the Butterfly House are raised here. The adult butterflies lay eggs in the Butterfly House; and the eggs are hatched and reared. This summer, the VIC has an intern and several volunteers taking turns with collecting. When was the Butterfly House built? The Paul Smith’s College VIC Butterfly House first opened in July 1993. 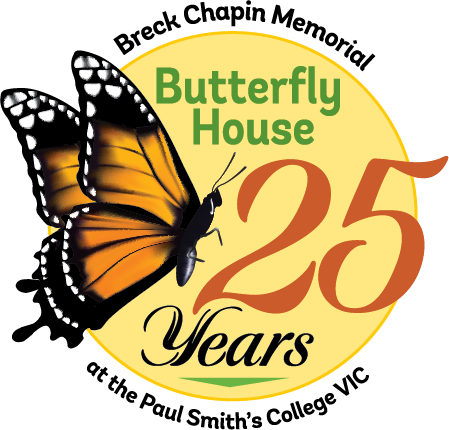 It is named after the late Breck Chapin, who served as the coordinator of volunteer services at the Paul Smith’s College VIC from 1990 to 1998 and played a major role in the construction of the Butterfly House when the facility was managed by New York State. The facility also benefited from an international collaboration with the Montreal Insectarium, the largest insect museum in North America. How is the Paul Smiths Butterfly House constructed? The Butterfly House is made of wood, metal poles, and netting. Each fall, VIC staff and volunteers remove the fragile netting and store it away for the winter. It takes a team of 6+ people, 2 ladders, and dozens of zip-ties to put the net up every June! How is the Paul Smith’s College VIC Butterfly House unique? This butterfly house is the only such facility in the Adirondacks. When the House first opened in July 1993, it was one of the first of its kind in the US to concentrate on native species butterflies and is still one of very few that does so. Most other facilities are year-round indoor facilities which house both tropical and native species butterflies. Instead of focusing on exotic species, the Paul Smith’s College VIC Butterfly House reflects what is really happening in the Adirondack Park, at the exact time that it is happening. All insects in the Butterfly House are collected by VIC volunteers from the immediate area or raised in the Butterfly House. Is this the only butterfly house in the Adirondacks? The Paul Smiths Butterfly House is the only such facility in the Adirondacks. Several other facilities have butterfly gardens, similar to the Monarch Waystation in Pollinator Alley, right next to the VIC Butterfly House. What butterflies and moths will visitors see in the Butterfly House? What a visitor will see depends on the weather, time of the summer, and the time of day. Canadian Tiger Swallowtails are an early summer butterfly which enjoys drinking lilac nectar. Monarchs can usually be seen all summer because VIC staff and volunteers raise them throughout the summer in the Butterfly House, providing multiple generations. Recent warmer and more humid summers have impacted the timing of some species, including the late-summer timing for Monarch Butterflies ready to migrate south to Mexico. What is the best time of day to view the butterflies and moths? Does the VIC allow groups in the Butterfly House? Of course! We welcome groups of any size. We do limit the number of visitors inside the Butterfly House to about a dozen individuals at a time, as a larger number is not safe for the butterflies and moths. However, we are happy to work with you to stagger the members of your group so that the butterflies and you can all have a great time! Can visitors bring in photos of insects and ask for help in identifying them? Yes! One of the main missions of the VIC is to provide information on these colorful insects. Please stop by our butterfly house or front desk and talk to a naturalist about any questions or photos you’d like to share.